Pull up your virtual armchair & explore group book selections, authors, events, or any other things of a mysterious nature we can come up with! MAF members met over scones to discuss our latest turn on all things Sherlock Holmes: The Sherlockian by Graham Moore. In the past year we have taken a look at Sir Arthur Conan Doyle’s classic tale, The Hound of the Baskervilles, talked to Doyle expert Daniel Stashower, author of Teller of Tales: the Life of Arthur Conan Doyle, joined members of the library’s film discussion group, Just Between Frames to see & discuss the BBC TV Sherlock episode of The Hound of the Baskervilles, and finished the year with the first original Sherlock Holmes story to be approved by the Doyle estate: Anthony Horowitz’s wonderful The House of Silk. The Sherlockian gave us yet another perspective: that of the Holmes scholars who study all things possible about the great detective and what is known in their circles as “The Canon” – the 4 novels and 56 short stories that make up all the Sherlock stories written by Arthur Conan Doyle. The term is useful since many people have gone on to write pastiches and novels involving Sherlock Holmes, Dr. Watson, and even Moriarty in stories of their own. The group talked about the ongoing appeal of Holmes, his world, his creator’s life, and how in this novel, that world is juxtaposed against modern times, and real facts and events, in the alternating chapters that deal with “Sherlockian” Harold White. White is just being admitted into the Baker Street Irregulars (a real Sherlockian society) when a (fictional) noted Holmes scholar, Alex Cale, is found strangled by a shoelace in his hotel room – just before he was to reveal the contents of Arthur Conan Doyle’s missing diary. Both the murder of a Sherlockian, and missing Doyle papers and journals, are historical facts as well. As the author mentions in the end notes, “the world’s foremost scholar of Sherlock Holmes”, Richard Lancelyn Green announced he had found Doyle’s lost papers, a dispute about them arose, and he rightly feared for his life when on March 27, 2004 he was found strangled with one of his own shoelaces. We talked about other things in the book that had been fictionalized but based on real facts – a style that occurred in both the storyline involving Doyle and Bram Stoker in the 1900s, and the current day events involving White and his “Watson”, Sarah Lindsay. Several members commented on how some readers have read the book by reading only the chapters with Doyle & Stoker (who really were friends) and then reading the chapters about White’s search for the missing diary. They felt it was easier to keep track of the two storylines by reading it that way. We talked about what these readers may have lost by not reading the interweaving of the two. Some felt it works either way, some felt that Moore’s comparison between the age of Holmes and Doyle both when the stories were written and today comes across more strongly when you’re reading the past & current story lines together. We talked about how the Holmes stories of “the Canon” are highly influenced by Romance (with the capital R) where there was “An artistic and intellectual movement originating in Europe in the late 18th century and characterized by a heightened interest in nature, emphasis on the individual’s expression of emotion and imagination, departure from the attitudes and forms of classicism, and rebellion against established social rules and conventions.” (http://www.thefreedictionary.com/) Exemplified in some ways by Holmes (rebelling against established rules and conventions) and Watson/Doyle (who emphasize their expression of emotion and imagination), and how the Romantic poets and authors such as Wordsworth, Byron and Shelley would all have been influences on Doyle and his peers. At the same time, we also discussed how (particularly Sherlock) both story lines explore the advantages of rationalism, and the coming age of scientific discovery and modernization (shown through the installation of electric lights on Baker St. for example) can (literally!) bring clarity to situations. What drives both story lines and brings home the universality of Holmes appeal, is how we are all driven by the “need to know“. One member mentioned how Harold – a lifelong fan of all things Holmes – is willing to smash anything in the Sherlock Holmes museum to find the diary and finally know: both that it exists and what it contains however unpleasant or ugly its contents may be. This led to talk about what happens concerning the diary and whether or not it was a fitting conclusion. We also speculated on whether the contemporary story’s ending will lead to a relationship and/or further adventures for Harold and Sarah. There was also discussion about the final story resolution about the diary that would create a spoiler here. Please click here to go to this point if you have read the whole story or do not care about spoilers. While the group will be taking a break from the world of Sherlock for the remainder of the year, the group’s enthusiasm for it and all the books and shows we have covered on Holmes and Doyle prove Sherlock is doing fine in the 21st century! Next month, the group is highly looking forward to talking with author favorite, Hank Phillippi Ryan when she calls in on Thursday, Feb. 20th to join us on the second Jane Ryland mystery, The Wrong Girl. The group is following this series, as we did with Bryan Gruley’s Starvation Lake trilogy. 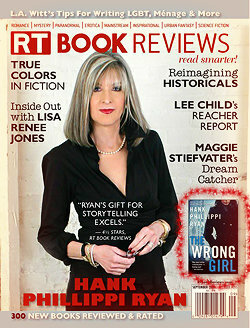 Next Discussion : “The Wrong Girl” by Hank Phillippi Ryan!! Murder Among Friends celebrates the month of love and friendship with a special call-in by one of our favorite authors, Hank Phillippi Ryan. Hank will be joining us to discuss the 2nd Jane Ryland mystery, The Wrong Girl. At our group's Planning Meeting for the 2014 books, we decided that we wanted to follow Hank's latest series - just as we did with Bryan Gruley's Starvation Lake trilogy - so we can better appreciate the development of the character over time and in different situations. As Hank tells it, this time out, Jane is confronted with the question: does a respected adoption agency have a frightening secret? Tipped off by a determined ex-colleague on a desperate quest to find her birth mother, Boston newspaper reporter Jane Ryland begins to suspect that the agency is engaging in the ultimate betrayal—reuniting birth parents with the wrong children. For detective Jake Brogan and his partner, a young woman's brutal murder seems a sadly predictable case of domestic violence, one that results in two toddlers being shuttled into the foster care system. Then Jake finds an empty cradle at the murder scene. Where is the baby who should have been sleeping there? Please join us on Thursday, February 20th at 7: 00 p.m. in Meeting Rm. B to pick up our trail on Jane Ryland (first seen in The Other Woman) - & Hank! We'll start discussing the book at 7:00 and at 7:30 p.m. it will be our great pleasure to welcome Hank herself, who is calling in to the discussion. Click on the graphic above to go to our catalog and reserve a copy of the book! MAF 2014 Discussion Books Bookmark: Jan. – Aug.
Click on the bookmark below to go to the MAF Reading List and the full book summary and links for each title! Murder Among Friends Blog Has a New Site! This Just In from the 2014 Love is Murder Conference! Daniel Stashower Is Coming to Anderson’s – Tonight! All postings are public, thus viewable by the entire Web community. We encourage the personal expression of opinions, but ask that anyone posting please be respectful of the opinions of the Lisle Library District. We reserve the right to remove any objectionable content posted at any time, without warning. By posting here you agree to follow the TOS of Wordpress.